The growing use of reclaimed water in agriculture worldwide calls for developing high-sensitivity methods to quantify wastewater-derived organic contaminants in soils so that the potential risk of this irrigation practice can be properly assessed. This work describes an analytical method for the determination of trace levels of 14 drugs that are known to be poorly removed during conventional wastewater treatment in soil. The analytes selected for investigation included ten pharmaceuticals from different therapeutic classes (carbamazepine, diclofenac, cis-diltiazem, lamotrigine, methadone, midazolam, oxcarbazepine, sulfamethoxazole, trimethoprim, valsartan), one illicit drug (cocaine), and three transformation products/metabolites (acridone, 4′-hydroxydiclofenac, and valsartan acid), thereby covering a broad range of physical–chemical properties. 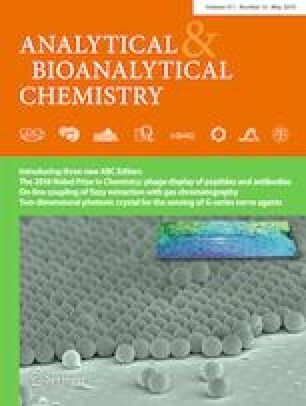 The methodology developed was based on ultrasonic solvent extraction (USE) of the analytes from the soil matrix, and subsequent clean-up and analysis of the USE extracts with a fully automated approach by means of solid-phase extraction and liquid chromatography-tandem mass spectrometry detection (online SPE-LC-MS/MS). The method was fully validated with affording method detection and quantification limits ranging from 0.03 to 1 ng g−1 and from 0.09 to 3.3 ng g−1, respectively. 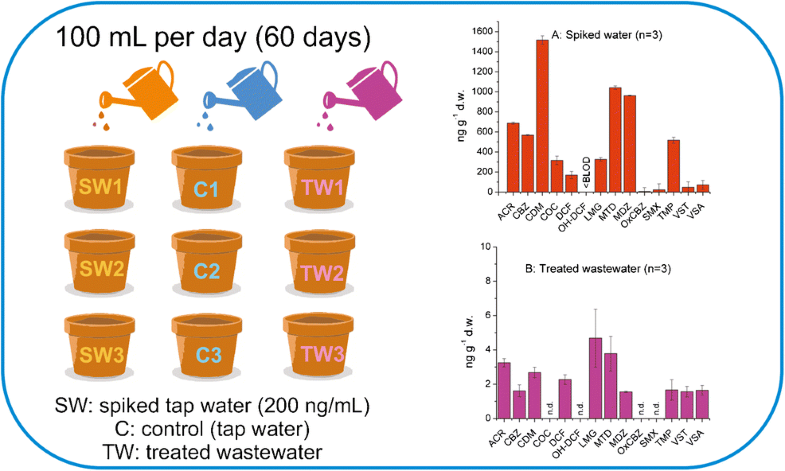 This method was applied to investigate the fate of the selected drugs in potting soil irrigated for a long term (60 days) either with water containing the target compounds at a concentration of 200 μg L−1 or with wastewater treatment plant effluent and thus, at real environmental concentrations. All investigated compounds were found to accumulate in soil irrigated with artificially fortified water. The highest accumulation potential was observed for cis-diltiazem followed by methadone and midazolam that presented average concentrations of 1517 ng g−1, 1041 ng g−1, and 962 ng g−1 d.w., respectively. On the contrary, oxcarbazepine (5.8 ng g−1) and sulfamethoxazole (22 ng g−1) were the target drugs presenting the lowest accumulation potential. Only trace levels of ten drugs were measured in soil irrigated with regenerated water (average concentrations between 1.6 and 4.7 ng g−1 d.w.). The online version of this article ( https://doi.org/10.1007/s00216-019-01715-3) contains supplementary material, which is available to authorized users. The authors thank the Water Challenges for a Changing World Joint Programming Initiative, and the Spanish Ministry of Economy, Industry and Competitiveness (MINECO). The EU is not liable for any use that may be made of the information contained therein. This study has been financially supported by the EU through the WaterJPI-2015 AWARE project (PCIN-2017-067) and the Generalitat de Catalunya (Consolidated Research Group “2017 SGR 01404 - Water and Soil Quality Unit”).